So Rose would know the difficulties of starting a business. Even the most successful start-ups will run into challenges and barriers that require perseverance and inventiveness to break through. Agrinfo, the company she founded with business partner Grace Makanyaga, is one of those lucky start-ups. “Agrinfo is essentially an online database that registers land ownership in villages”, Rose explains. Usually, in many parts of Tanzania, ownership is written in village customary documents that offer unclear or non-absolute descriptions of plots of land, such as “north of John’s land”. These documents are kept in depositories where consulting them is a demanding and bureaucratic process, and is even harder when land changes hands and a sale has to be formalised. Through her own land-buying experiences as member of a timber-investment group, Rose found out at first hand how difficult this process can be. The usefulness of a database containing verifiable and accessible data seemed obvious and Rose partnered with Grace – who was then her student – to start brainstorming about what would become Agrinfo. But there were many challenges: farmer organisations did not want to share the land data they managed with a new company without first seeing a more developed product, while banks were not ready to invest in the development of that product without seeing the crucial data that the company would depend on. They had a stroke of luck, but only after putting in some hard work. Through a local technical hub, Buni Hub, Rose found out about the first CTA Agrihack organised event in East Africa; she entered it, and among fierce competition, Agrinfo became second regional runner-up. This resulted in some much-needed investment for the new enterprise, and more importantly: a valuable business incubation period that brought skills and knowledge to develop the company to where it is today. Rose therefore suggests that ICT schools should include a practical entrepreneurial component for students who want to be entrepreneurs in the future. Agriculture is an area which offers plenty of opportunity and space for new ICT entrepreneurs. “Everybody involved in farming wants to produce more and reach more markets. If companies develop new technologies that can help agricultural stakeholders get this, they will go for these products”. The future for ICTs in agriculture is clearly very positive in Rose’s eyes. A key challenge that remains is how to engage more youths in this pursuit, a task that traditional institutions are not always equipped for. ICTs in agriculture are still a new field; and as Rose’s story exemplifies, established organizations like banks and farmer organizations may struggle to understand all the potential it offers. “If schools and universities vie for their students and guarantee that they are capable of being entrepreneurs, other institutions will take up the challenges that remain”. It is therefore really needed that governments in Africa, Caribbean and Pacific countries as well as development agencies better support youth agricultural entrepreneurship including ICT for agriculture entrepreneurship. 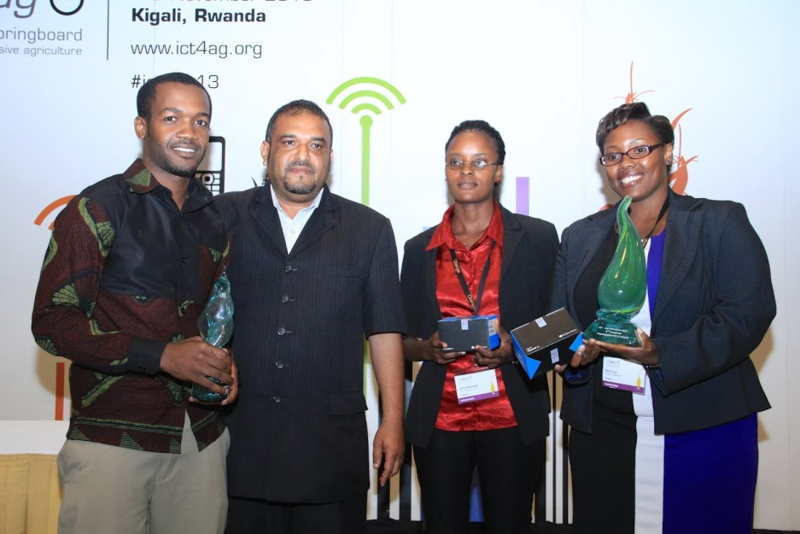 In the meantime, Rose and Grace are eager to exploit the opportunities of ICTs in agriculture. They have undertaken a soft launch of Agrinfo and are now uploading the first official paid for data. They are also in talks with two large farmers associations to have MoU in place in order to work with their farmers. They are very eager to address all challenges faced and are hoping to develop Agrinfo into the “Google of agricultural land information” in Tanzania and beyond – an ambition that may not be as far-fetched as it sounds.